At the YMCA of Port Angeles we offer two Youth Indoor Soccer leagues, Mini Kickers (ages 3-5) and Little Foot (ages 5-7). Mini-Kickers is an introduction to basic soccer skills and team sports. Children will do a variety of group drills, games and scrimmages during this ongoing skills clinic. Mini Kickers is 6 sessions beginning the week of February 18, 2018. Registration begins December 10, 2018 to January 25, 2019 or when teams are filled. Space is limited in our Youth Sports Programs. Where should I sign up? Please see a Member Service Representative at the YMCA of Port Angeles. This introductory league helps players learn new skills and improve the ones they have. Children learn team concepts, rules of the game, and individual skills. Little Foot soccer is an 8 week season with 6 games. Practice will be held once per week; time and location dependent on coach and gym availability. Practices begin the week of February 4th and the season will end with the final game on March 30th. Games are played on Saturdays beginning February 23rd at the YMCA of Port Angeles. All players are guaranteed equal playing time. Please see a Member Service Representative at the YMCA of Port Angeles or click on the link below. 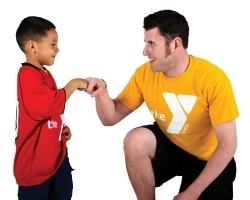 Children who play sports at the YMCA discover so much more than their athletic abilities. They build character, develop self-confidence, create healthy relationships—and you can have a role in this transformation. When you volunteer as a coach or referee, you’re helping others, meeting new people, keeping your mind and body healthy and learning new skills—and all of this feels great. Doing something you love, while making a difference! Whether you love the sport, working with kids, coaching, or giving back—you can enjoy your passion in a family environment, while using your life experience to make a difference in the lives of kids. Contact our Sports Coordinator, Trent Wiles for more information.